"I just received my exquisite granite pedestals ......they are truly works of art! I just wanted you to know that they arrived in perfect condition and they are more than I even expected. The mitered joints are invisible and the overall workmanship is superior to anything I have seen here on the West Coast. If I have the opportunity, rest assured that I will use you again, and can certainly refer clients directly to you, where appropriate. Thank you so much for exceeding my expectations!" "I have received your invoice and the pedestal, I am very pleased with the quality and design of the pedestal... ...Thanks very much for such great service and delivery of a quality product. I have forwarded your web address to our contact at the Wyland Galleries in Hawaii. He manages that gallery and they have been recommending another supplier. Your quality and price is much superior, so hopefully he will send some additional customers your way. Best regards." We specialize in quality workmanship for your custom bases and pedestals. Welcome to our home page. Please feel free to take a look around and let us know what you think. We hope you got a chance to stop and see our booth at the "Loveland Sculpture Invitational" last summer. We will be in attendance at this summer's show and are looking forward to seeing you there. Our goal with all the bases and pedestals we craft is to better display and enhance the art that is placed upon them. In order to achieve this goal, we offer free design consultation services. All of our products including pedestals, tables and bases are of selected quality solid woods and stones. 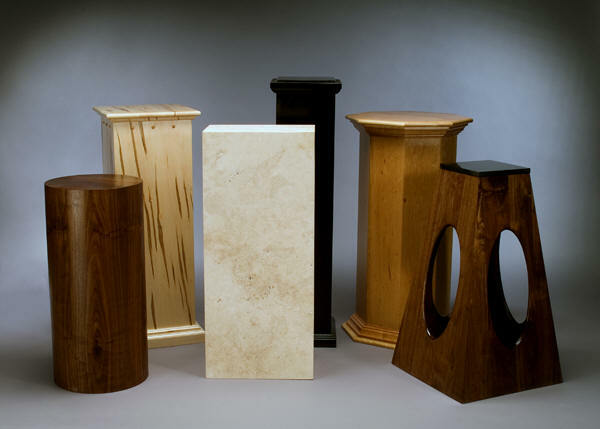 Bases and pedestals are custom products made to your specifications. As such, we do not offer a pricing "catalog", only styles here for reference and discussion. Each piece is priced individually depending on size and materials required to create it. We will provide a quote upon receiving your specifications and prior to starting work to create your individualized base or pedestal. We produce, as well, contours, round or oval pedestals of almost any height using wood veneers. We have some very unique designs we have evolved ourselves, made to your size needs or we can create a completely custom-designed piece to your specifications. The Base Shop has been fabricating stone to enhance your customized bases and pedestals for over a decade. We are able to create round, square or contoured stone to fit or be inlayed into your particular base or pedestal. We cut and polish our own stone. We can also embed turntables, complete custom edge routes, and install lighting to further enhance your art. base bases "sculpture base" "stone bases" "motorized pedestal" "turntable pedestal" "motorized base" "display pedestal" "art stand" podium art bronze gold statue "display case" "memorabilia cases" "sports memorabilia stand" "artifact cases" "bronze statue base" "cast bronze sculpture" "sculptural art" "john w. peonio" "john and terri peonio" woodworking "custom woodworking" "custom bases and pedestals" "base shop loveland"